In the Q3 of 2018, Canadian Express Entry has set several records. Express Entry announced the biggest number of ITA's through this period, which was noticed by massive draw sizes but more significant requirements of CRS score. 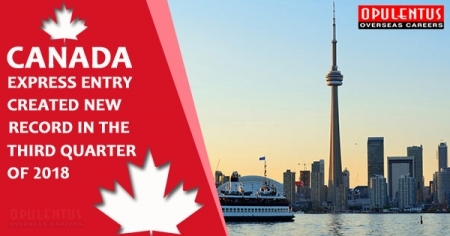 Over July, August and September 2018, Canadian Express Entry announced a sum of 22,800 ITA's. It is the biggest number of ITA's to have declared in the 3rd quarter, of all time since the Express Entry attained into existence in the year 2015. In June month, a sum of 7500 ITA's was announced over 02 draws, which in itself is a history. This trend remained in July and August as well, and 7500 ITA's were announced in these months too. Interestingly, in September month, the ITA's number announced increased to 7800. In the draw conducted on September 5, I.R.C.C announced 3900 ITA's, the biggest number of ITA's to have announced in a particular draw in 2018 untill then. I.R.C.C controlled the draw sizes big in the month of July and August, and it was the extension of the trend set by the I.R.C.C in December 2017. Since then I.R.C.C has been continuously growing the draws size by 250 or 500. I.R.C.C announced 3,750 ITA's in each of the 04 invitation rounds continued in July and August. But in September, size of draw got down from 3900 to 3500. During the Q3 of 2018, C.R.S score demands for all-program Canadian Express Entry draws continued in the 440-445 range. Experts notice that I.R.C.C will exceed the entire number of ITA's announced previous year if the draw sizes are kept to be maintained high. As per the Multi-Year Plan of Canadian Immigration Levels, the federal government is intending to allow 74,900 immigrants in the year 2018.